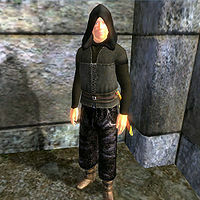 Shady Sam is a merchant who can be found day or night outside the Imperial City walls, northeast of the Chestnut Handy Stables. He sells poisons, potions, lockpicks, and is also one of two vendors who sell skooma in Cyrodiil. He is found next to a bush in the eighth indentation of the city wall, to the left of the Talos Plaza District door, never eating or sleeping. He wears a dark shirt, black wide pants, leather boots, and a black hood. He carries a leveled shortsword and has a chance of carrying some gold. When someone approaches Shady Sam, he will whisper for them to come closer to conduct business: "Psst! Hey you! Yeah, you! Come here! I got what you need..." Speaking to Shady Sam will have him greet you by saying: "You need something... special? Check out my wares. You won't find this stuff at your local general store, that's for damn sure." Once you end a conversation with Shady Sam he will remind you to visit him again: "Come see me anytime, friend. I'm here day or night." Due to the "Evil" flag on his faction, killing him will not get the attention of the Dark Brotherhood. Items pick-pocketed from him will not be flagged as stolen. Shady Sam is one of only three service providers in the game who cannot be persuaded, limiting your options for how to increase his disposition towards you. This also means that it is more awkward than usual to access his barter menu. The down control does not work; you must instead use the left or right controls (either via the thumbstick or direction controls). This page was last modified on 31 May 2014, at 15:02.